When Samira Wade sat in Salem County Prison in July 2017, she received an unexpected visitor — Kisanna Owens, prison re-entry coordinator at Catholic Charities. “I was getting close to my release date. I was told that [Owens] was there to help me transition to life outside of prison,” Wade said. Upon being released, life outside of the walls proved to be much more challenging than Wade expected. After spending six months in prison, Wade tried to start over alone. “I just kept hitting roadblock after roadblock,” she recalled. Eventually, feeling lost and isolated, Wade hit her rock bottom. As a recovering addict, she found herself wanting to use again. 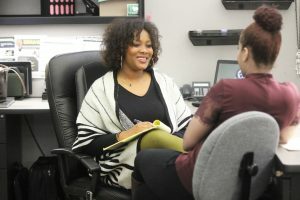 The two began meeting regularly, and Owens immediately took action, providing Wade with much-needed counseling and support. Almost exactly one year following her prison release, it was Wade who called in to check up on Owens — and to thank her. Wade has remained sober, and is currently studying to be a medical assistant. When she called Owens, she was taking a break from studying.